South Jersey writes: Hi Ben! I have a VCR player with some old VHS tapes I like to watch, and I was looking into getting an HDTV (my first). The salesmen told me I’d need an HDMI cable, but they didn’t know the price of the cable or even bother to ask if I had HD service. One salesman didn’t even know what HDMI was. However, his co-worker did. Would I need one for a VCR? Neither of them knew that. Greetings, and congratulations on surviving the TV department! Sounds like you made it out unscathed, albeit unsatisfied. 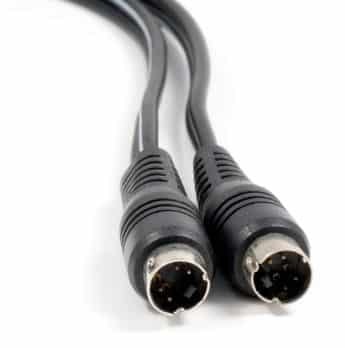 A composite video cable, which will connect most VCR players to an HDTV. Anyway, yes—it is possible to hook up your old VCR player to a new HDTV, even if your VHS deck doesn’t have an HDMI video output (which I’m almost positive it doesn’t, unless you happen to have a newer DVD/VCR combo player). Note: The following tip deals only with hooking up a VCR to an HDTV for playback only. Want to record, too? Check the “bonus tip” below. 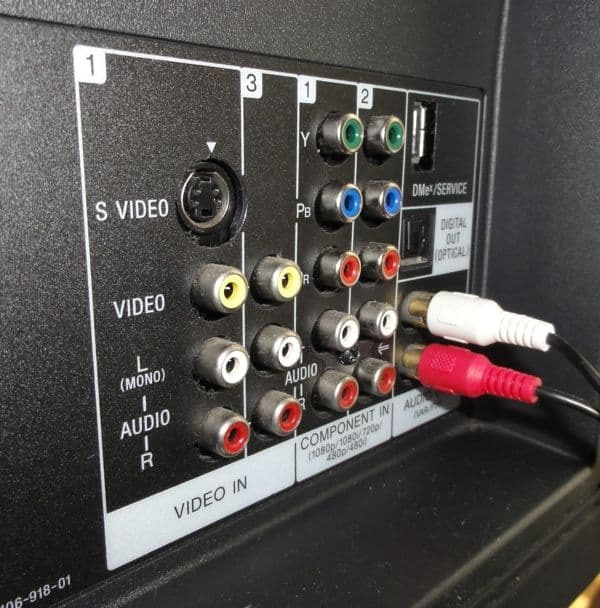 In addition to HDMI inputs (usually labeled “HDMI 1,” “HDMI 2,” etc,), most HDTVs will have at least one set of older video ports (perhaps labeled “Video 1” or something similar) that will work with the vast majority of VCRs. The most common type of input is called “composite,” and it looks like a small, metal-tipped plug (also known as an “RCA” plug) that should be familiar if you own a home stereo system. An S-Video cable, which delivers a slightly sharper picture than composite video does. Another common video input is called “S-Video” (a.k.a. “Super Video”), which comes with a slightly larger plug that has a series of small, delicate-looking pins jutting out of each end. Well, S-Video offers slightly better video quality than a composite video connection, but fewer and fewer HDTVs have S-Video inputs these days. Check the back of your HDTV and VCR, and if you find S-Video connections, great. If not, you’ll have to settle for composite (and to be honest, composite video doesn’t look that much worse than S-Video, so I wouldn’t sweat it). 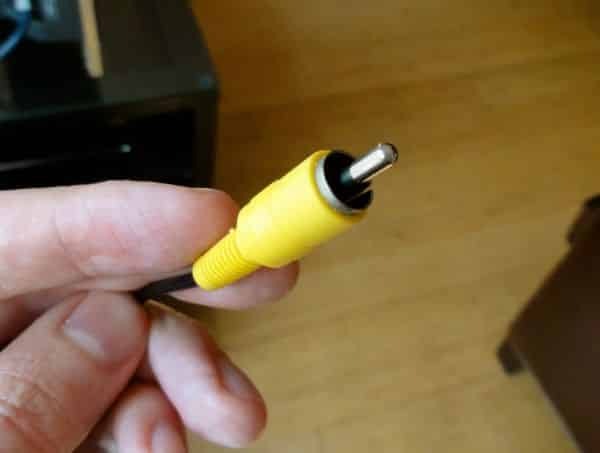 In addition to composite and/or S-Video inputs and outputs, both your old VCR player and new HDTV should have a set of older, stereo RCA plugs that go with them—one plug (usually red-colored) for the left channel, and a second (typically white) for the right. S-Video, composite video, and stereo audio inputs on the back of an HDTV. All you need is a stereo audio cable—which, again, will look familiar to anyone with a home stereo. Now, when you go HDTV shopping, just make sure the TV set you pick has either an S-Video or composite video input. Remember, you can always ask the sales clerk to show you the back of the set. What about the cables themselves? Well, the store may have some for sale, but beware of salespeople hawking overpriced composite cables. Plenty of perfectly good cables are available (both online and in stores) for less than $10 each. Bonus tip: What about recording with an old VCR? Hooking up an old VCR player to a new HDTV to watch old VHS tapes is one thing; trying to record with an old VCR is a whole different deal, however. First of all, your old VCR might not be able to record TV shows at all—not even off an antenna—unless it has a digital TV tuner. If your VCR is more than, say, 10 years old or so, it’ll probably need a DTV converter to receive local TV signals. Also, even if your VCR can accept a digital TV signal, remember that it can’t record in HD—only SD. 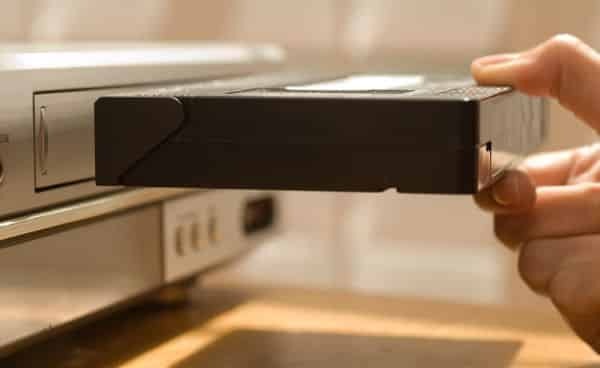 Finally, bad news if you were hoping to record cable TV with your old VCR. The days of getting free, basic-cable TV without a cable box are (alas) mostly over. Sure, you’re welcome to try plugging your cable into the back of your VCR (assuming, again, that your VCR is DTV-ready), but most of the big cable carriers scramble all their channels, including basic-cable channels. And good luck finding a modern cable TV box with VCR-friendly “analog” outputs. In other words, you’re probably better off recording TV shows with a TiVo (which will work with an over-the-air antenna) or a DVR from your cable company.